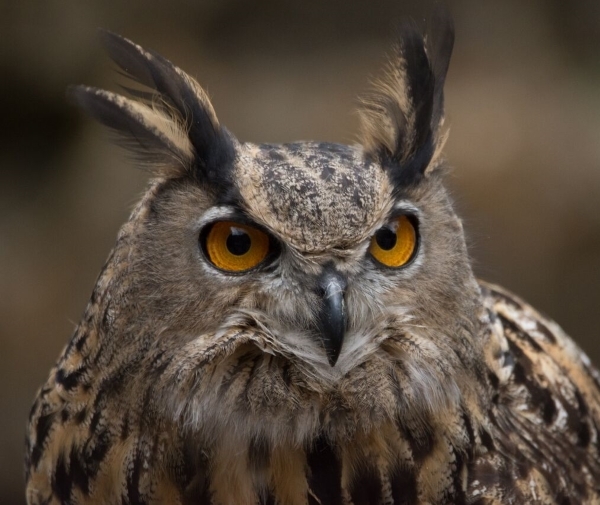 Maximus, a Eurasian Eagle Owl, was born at a captive breeding program in New York, USA in spring of 2011. We got news of his hatching soon afterwards. 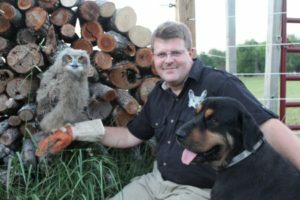 Maximus would be an outstanding opportunity for Rise Raptor Project to bring an owl on board. Why you might ask? Well, owls are difficult birds to train for use in education programs. If you can start training as a chick you stand a far better chance of having a bird who is comfortable in large crowds, and is calm in spite of countless distractions. Our position on the use of animals for education purposes demands our birds be in a calm, content state of mind in their human world. Maximus would be a perfect fit. Part of being comfortable is having a nice home. 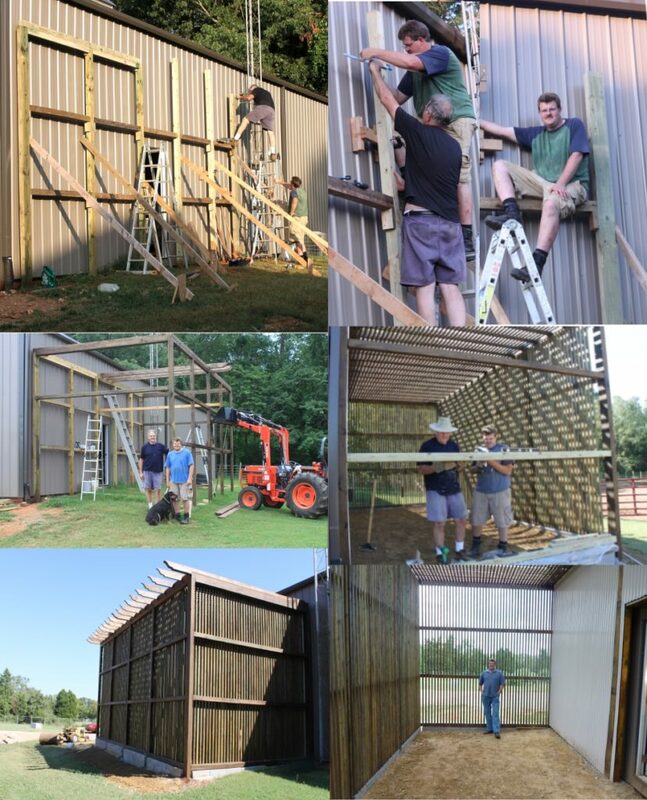 To fulfill this requirement, we constructed Maximus a large flight cage in which to stretch his wings and rest when he is not working to educate people. It is safe, open and airy, and gets a nice mix of sunlight and shade. 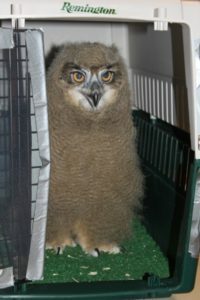 It also exceeds all standards set forth by the USFWS for a bird like Maximus. 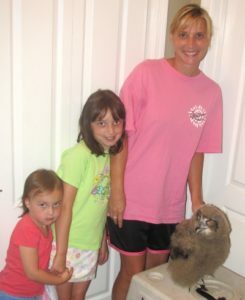 After adding some grass and prime perching spots we were ready to bring Maximus home. 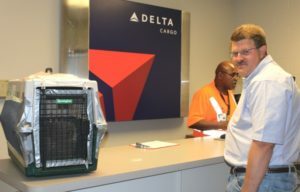 He migrated south aboard a Delta Airlines flight from New York to Huntsville Alabama where we picked him up. After a short drive Maximus made his first appearance at his new home. 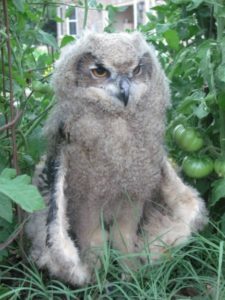 At just 5 weeks old he was close to his adult size but looked more like a q-tip with gigantic eyes than an owl. Nevertheless, this big guy was eager to start his training. In those early days, Maximus went everywhere and experienced everything we could think to put in front of him. He spent many of his days napping and playing with Christina Turner and her 3 children. 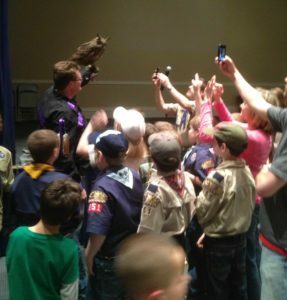 It was sort of like daycare for owls in training. In addition to daycare Maximus would spend his evenings being exposed to countless other situations and stimuli. He also got some time to explore the great outdoors where there were plenty of plants and animals to encounter. Ah, the smell of basil leaves! 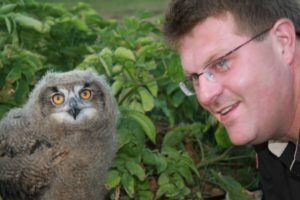 Wait, did you know owls can’t smell? Getting comfortable with dogs was a big step for Maximus. There are many of our programs where dogs are present. Maximus not only is comfortable with dogs but also learned to get along with horses, goats, and even chickens. As he grew it was fun to see him developing his adult feathers. He began to exercise his wings more. In spite of not quite being able to fly he had some impressive baby feet. 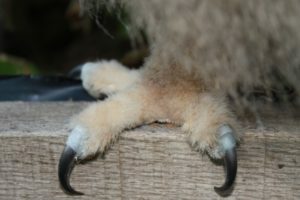 Wow, look at those baby talons! They are needle sharp and a formidable force when they need to be. Thankfully, he learned early on to be gentle on the glove. In addition, he was taught to be gentle with his feet when they are handled. This is a critical behavior to train for the purpose of proper health and maintenance of his feet. Maximus didn’t waste any time getting into the spotlight, doing his first program at about 8 weeks old. He has since taught thousands of people and served as an outstanding ambassador of his kind. Maximus even has his own book promoting literacy. See how you can help him encourage children to read.